Everyone has different strengths, weaknesses, and traits that lend to their success in different areas. Personally, I love the analytical, data-driven nature of my work. And, not to blow my own horn, but I’m not bad at what I do! But if you put me in another setting — say, a daycare center, or a nursing home — I just can’t see myself thriving as a caretaker, charged with the health and well-being of others. We all have our strong suits. Recognizing what type of personality you have is incredibly helpful in determining just what it is you should be doing with your life. I found this recent study on the impact of personality on career achievement really interesting. While you very well could get involved in any career you choose, it’s important to realize that your personality type greatly influences your professional success and happiness on that path. Life Style: judgers (54%) and perceivers (46%). Determining your personality type and thus settling on an ideal career is all about knowing how you fit into each dimension. Empaths: enjoy careers that make the world a better place. Some people try over and over again to find the right career, but always seem to feel like a square peg trying to fit into a round hole. With an ESTJ personality, a career as a chef, loan officer, or general manager is right up your alley. Trying your hand as a home health aide (ISFP) or teacher (ESFJ) is not likely to yield a positive response and long-term career. 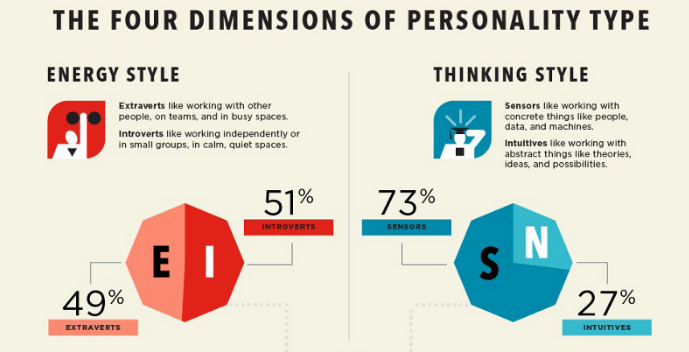 This infographic from Truity explains the common personality types and which careers are best for each.